Analysis: Trump Claims Election Night Credit. It’s Not That Simple. 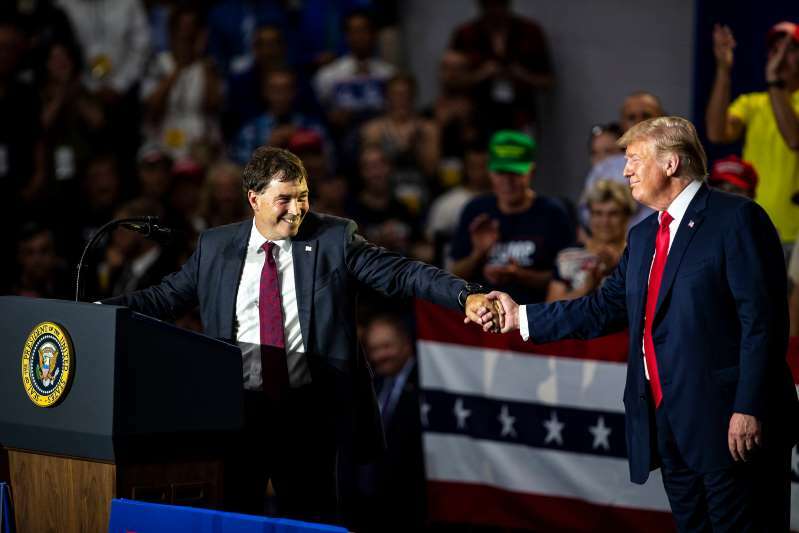 President Trump bragged about “a big turn for the better” in Troy Balderson’s House campaign after the president held a boisterous get-out-the-vote rally in Ohio on Saturday night. In President Trump’s mind, he has become the indispensable man, the political force singularly responsible for the narrow lead that Troy Balderson, the Republican candidate, clings to in a heavily conservative Ohio House district and that Kris W. Kobach maintains in the Kansas governor’s primary. But the presidential braggadocio that followed Tuesday’s election night squeakers ignores another reality that the White House is loath to acknowledge: Mr. Trump — and his chaotic, controversy-laden tenure in the Oval Office — is largely responsible for the toxic political climate that is undermining the Republican candidates he is trying to save. Economic growth topped 4 percent earlier this year. Unemployment is low; stock prices are high. Yet Republicans speak darkly of the awful environment their candidates face in midterm elections 90 days away. “As long as I campaign and/or support Senate and House candidates (within reason), they will win! I LOVE the people, & they certainly seem to like the job I’m doing. If I find the time, in between China, Iran, the Economy and much more, which I must, we will have a giant Red Wave!” he boasted Wednesday on Twitter. It is impossible to know for sure the impact of Mr. Trump’s last-minute help in an Ohio district that Republicans should have won easily. The president could be right that he lifted turnout among Mr. Balderson’s supporters just enough to secure the win, if and when it is declared. Or it’s possible that his rally did nothing much — polls ahead of Election Day suggested a one-point race, which is about where it ended up. Nor is it possible to gauge the impact of a late-tweeted endorsement of Mr. Kobach, the divisive Kansas secretary of state who headed the president’s voter integrity commission before challenging the sitting Republican governor. The president’s political advisers said internal polling in Mr. Balderson’s race showed him trailing, and turned around only after Vice President Mike Pence visited and the president held the last-minute rally. They noted that far more Democrats were voting early than Republicans in Ohio until those White House visits. But Republican and Democratic strategists alike said Mr. Trump’s low approval ratings and his lack of a disciplined message about the booming economy had harmed Republican candidates in general this year. In recent weeks, Mr. Trump has escalated trade wars with China and the United States’ European allies, complained repeatedly about the investigation into Russian election interference, caused a border crisis by separating migrant families, attacked the N.B.A.’s most popular star and praised President Vladimir V. Putin of Russia. Frank Luntz, a longtime Republican pollster, said the president was “unmistakably the most powerful, influential person” among his loyal supporters. He can make a difference in close races by generating enthusiasm in his political base ahead of Election Day. But Mr. Luntz said that scores of Republican candidates are facing a disastrous election season in which independent voters are leaning heavily toward the Democratic Party and away from Mr. Trump — and Democrats are at least as energized by Mr. Trump’s involvement as Republicans. He said the president was fooling himself if he thought the Balderson race in Ohio, which remained too close to call on Wednesday, was a victory for the party. That is a point Democrats hammered home on Wednesday. The president — no surprise — sees it differently. “Why can’t they play it straight, so unfair to the Republican Party and in particular, your favorite President!” he continued. The president also claimed that his popularity with “the people” would help the Republican Party in the fall. In fact, Mr. Trump’s overall approval rating — which has hovered in the low 40 percent range for months — is among the worst of the last nine presidents for this point in his tenure. His Gallup poll disapproval rating, at around 54 percent, is considerably higher than Barack Obama’s 48 percent in the August ahead of the Democrats’ 2010 shellacking, although it is slightly lower than George W. Bush’s ahead of the 2006 midterms, when the Democrats took control of Congress. John McLaughlin, who was Mr. Trump’s campaign pollster and still does polling work for the White House, said Republican candidates needed to do more than just invite the president for a last-minute rally. He said they needed to more fully embrace the president’s agenda if they wanted to win. Mr. McLaughlin noted that more than 205,000 people who live in Mr. Balderson’s district voted for Mr. Trump in 2016 — more than twice the number of Republicans who voted for Mr. Balderson on Tuesday. Mr. McLaughlin calls the difference the Trump Voter Deficit. “Trump basically bailed out the G.O.P. establishment. They were losing until he got into the race,” Mr. McLaughlin said. He said Republican leaders in Washington had done too much to resist Mr. Trump’s policies on trade, immigration and the repeal of the Affordable Care Act. But many strategists say it is not that simple. While he remains exceedingly popular among self-described Republicans, that universe is shrinking, and Mr. Trump is making choices that complicate the party’s overall hopes of remaining in the majority after November’s elections. In addition to an agenda that has turned off many independents, Mr. Trump is complicating individual races by breaking from precedent and taking sides in contested primaries. In governors’ races in South Carolina, Georgia, Florida and Kansas, the president intervened to lift his preferred candidates and effectively handed the Republican Governors Association the bill. With hard-line candidates winning nominations thanks to Mr. Trump, general elections could prove more difficult for Republicans. And it will be up to the governors association to prop up the candidates the president effectively crowned. For some of the races — even ones in which Mr. Trump helped recruit the candidate — the best bet for Republicans may be to keep voters’ attention focused more on local issues and less on the swirl of national politics in Washington. Politics - U.S. Daily News: Analysis: Trump Claims Election Night Credit. It’s Not That Simple.